When you have a baby it really can feel like you need an army around you. It can be a huge life changing wonderful experience but it takes time to adjust to the new way of life and this tiny little human you are now responsible for 24/7. There are so many things I wish I had known before I became a first time parent, probably the most important one was to know that I might not love every single minute and that sometimes I will cry because I feel so overwhelmed, lonely and exhausted and that that’s okay. We are so consumed with all the wonderful stories and amazing parts of becoming a parent that we fail to prepare ourselves for anything negative because people don’t always like to share those experiences. However, that means we go into it with huge expectations and a false idea about how great everything is going to be, but no reality about any of the hard times. 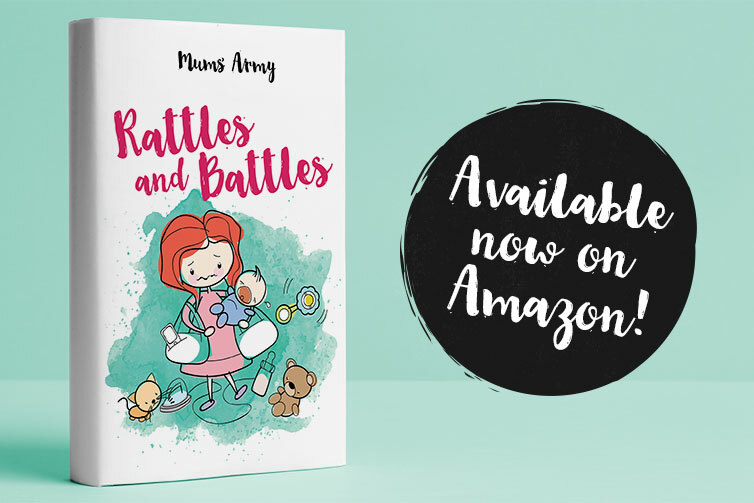 Our book Rattles and Battles tells you all about the ‘other side’ of parenting so that you can go into it with your eyes wide open and ready for whatever challenges you face. I truly feel that if I had read this book before having my first child it would have been a much more enjoyable experience. I wouldn’t have spent half of my time worrying why I was feeling negative about some aspects of having a baby and assumed I was the only one. We hope our book gives you insight, truth, confidence and reassurance on your journey into parenthood. Feel free to get in touch at hello@mumsarmy.co.uk, and don’t forget to follow us on Facebook, Twitter and Instagram!